We have parking facilities for approximately 100 vehicles on the grounds, during large functions and on special events parking restrictions will be in place and when capacity is reached the access road for entry for using our car park will be closed. 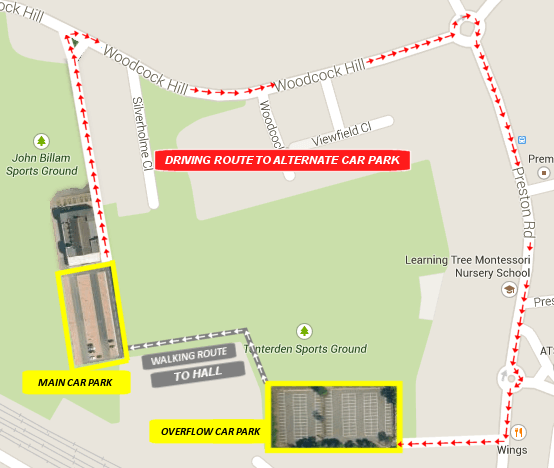 There is a public Pay & Display car park situated just off Preston Road as shown in the map below, we suggest all our visitors use this Car Park in the event our car park is full. The public Pay & Display car park can accommodate a further 166 vehicles and there is an illuminated pathway that leads directly onto our grounds, this is a short 4 minute walk, avoiding the need to walk all the way around the main roads. We actively promote 'Car sharing'. Car sharing is when two or more people share a car and travel together. One of the people travelling is usually the owner of the vehicle and the other(s) usually make a contribution towards fuel costs. It allows people to benefit from the convenience of the car, whilst alleviating the associated problems of congestion and pollution.